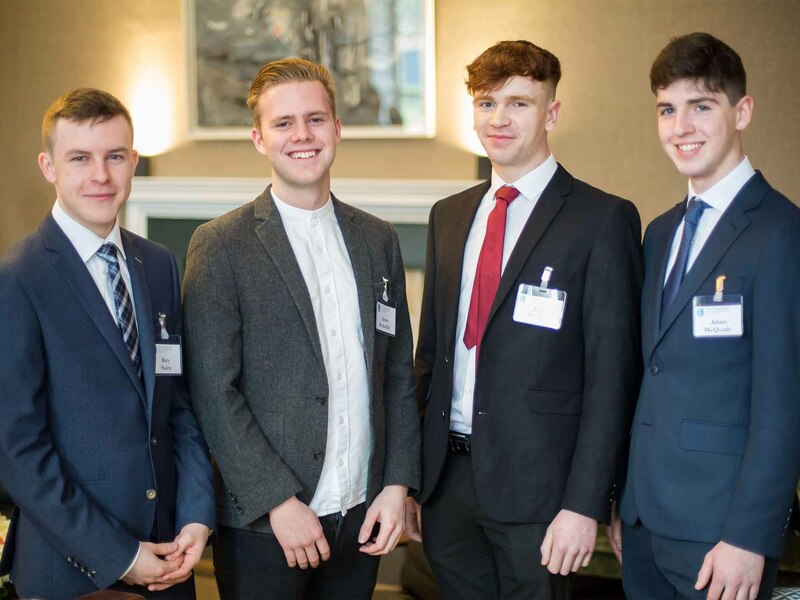 Four engineering students, who have demonstrated outstanding potential in their field, have won prestigious 2017/18 Kinsella Scholarships. The awardees are Rory Nairn, James McAuliffe, Jack Hickey and Adam McQuade who are in their senior fresh year. This is the third year that students have been selected by a panel made up of experts from Trinity and Jones Engineering Group. The Kinsella Scholarships were established in 2014 through a donation from the Executive Chairman of Jones Engineering Group, Eric Kinsella, and his wife, Barbara. “Jones Engineering Group, prides itself in the quality of our employees. Our investment in people has been one of the keys to our success. I know Trinity shares this view, and Barbara and I are delighted to be in a position to support tomorrow’s engineering leaders whom Trinity will be nurturing. As a Trinity engineering alumnus, engineering holds a particular importance for myself and Barbara, and I want to invest in future generations of the profession,” said Mr Kinsella. I was overwhelmed that I’d won such an amazing prize. I am so grateful to Eric and Barbara for their tremendous generosity. The scholarship will allow me to reduce the number of hours I work during the week, so that I can focus more on my college work. The Scholarship also allows me the freedom to explore new avenues, be adventurous in creative thinking and support others to think big. Mr Kinsella has also donated significant endowment funding for the state-of-the-art 24-hour student study space in the Ussher Library. Kinsella Hall, named in honour of Mr Kinsella’s parents, William and Kathleen Kinsella, allows Trinity students and researchers to access 600 study spaces day and night. Jones Engineering Group is a leading International Engineering Contracting Group of companies providing mechanical, electrical, instrumentation, fire protection and maintenance solutions to world-class clients. The Group comprises a number of engineering contracting companies that collectively deliver the complete range of engineering services.